Bill Cunningham at work. Photo by Steve Eichner. I went to see Bill Cunningham New York at Film Forum in Manhattan, possibly the only theater in the country playing it right now, until March 29. I wasn’t sure what to expect in terms of audience—when I went to see The September Issue in 2009 there were maybe seven other people in the entire theater with me but this was not the case with Bill. I saw the first showing on a Saturday afternoon and it was sold out! Even the front row was filled. And now I know Bill brings people together—the audience was gay, straight, young, old, black, white. It felt like the U.N. in there. There is great stuff in the film, from Bill’s beginnings as a milliner (selling under the name “William J.”) to being drafted into the Army in 1951 to filling Details magazine in its earliest days with pages and pages of fashion photographs. 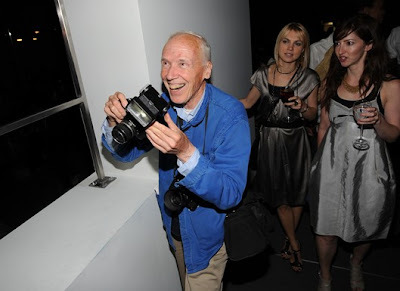 We see Bill Cunningham the New York Times photographer at his regular hangouts in Manhattan, snapping away on the streets and Bill the chronicler of the rich at charity events throughout the city, taking photos for his “Evening Hours” column but refusing even a glass of water at these fêtes, not wanting there to be any confusion as to why he is there, not as a wealthy and famous person himself (though he is very well known) but as a Times photographer working a beat. We also see an old man being evicted from the tiny bare-bones (no bathroom, no kitchen) artist’s studio in Carnegie Hall he has lived in practically his entire adult life, surrounded by filing cabinets filled with photographic negatives and a bed made up of a foam mattress atop wooden crates. Everybody who loves fashion should see this movie but it’s about more than clothes. At the center of the film is a very private man I found humble, simple, hard-working, frugal, loyal, surprisingly religious and deeply moving, as both an individual and a photographer seeking beauty. A highlight I will share illustrates the morality of his character. In the 1980’s Bill started taking pictures for Women’s Wear Daily. It was “On the Street” in its earliest incarnation—featuring, side by side, clothes, as they were shown on the runway, and then how real women wore them. Without Bill’s knowledge or consent, the powers that be at WWD decided to publish the pictures but to ridicule the way the real women wore the clothes. Bill was horrified, a friend of his told the filmmakers, he really had an affection for the women dressed in runway clothes as they went about their everyday lives and it disturbed him that WWD made fun of these women. He never worked for them again. I didn’t think it was possible for me to love Bill Cunningham any more than I already did, but after seeing this movie, I do. See (and hear) Bill's latest “On the Street” video, showing what Signs of Spring he liked from Paris Fashion Week here. Thanks for the heartwarming review - I really really really want to see this movie - even more so after reading this. I always imagined him to be a lovely man from his commentary on his On The Street series, and from what you've written about his personality revealed in the film, it seems that is exactly what he is. Praying this comes to London!! Fantastic review, my dear Jill. I wish the film came to my town, highly unlikly, but I am sure it will be on CD eventually. I'm excited to see this film now, though it will undoubtedly take many months to wind its way to the American midwest. What a wonderful anecdote you shared. You really have me wanting to see this film...i hope I get the opportunity. The snapshot you have given is the perfect way to hook me in!! Hi Veshoevius, I'm a low-key dresser so I don't think Bill would ever take my picture but I am convinced that if you come to town and put on some of the outfits you've featured on your blog, especially your opera outfit, Bill would be going crazy taking photos of you. Please come to NYC soon so we can try this out. You can be Bill-bait and I will take photos of Bill taking your photo. What do you think? Hi Sacramento, the film seems in limited release right now, but when it comes out on DVD I will be joining you in getting a copy. This is one I need for my collection. Hi Mom, Bill sounds as spry as ever in this week's "On the Street," featuring what people were wearing when NYC got to 72 degrees last week. Hi Terri, I read online that the filmmakers have told people they can request that Bill Cunningham New York come to their local art house theater and that if enough people request it, it can happen. There is also a list of where it's playing on the billcunninghamnewyork.com site. Hi Pam, I think you'd really like this movie, his love of fashion on real women is absolutely contagious. I love how he always tells people to "have fun with it." Hi Steph, thanks for stopping by, how are you? I couldn't believe how many people turned out for this movie, it seems Bill Cunningham is beloved by many, and for good reason, like you said, he is genuinely kind. Let me know what you think of the movie when you see it!